1992 was only the second year that the Blue Knights made the Finals at the DCI World Championships, placing ninth. A year after first becoming a finalist, (also finishing in ninth place), the corps went a step further from the inclusion in 1991 of Copland's "Outdoor Overture" by presenting "Portraits of Aaron Copland." The show consisted of "Billy the Kid," "Corral Nocturne" (from "Rodeo"), "The Red Pony" and "Chorale and Shaker Dance." I guess the show could have been named, "Portraits of Aaron Copland and John Zdechlik," but that wouldn't have looked nearly as cool on a T-shirt. The logic behind the Zdechlik closer is that it is based on Shaker hymn "The Gift to Be Simple," the same tune that plays a major role in Copland's "Appalachian Spring." The show started out quiet and reserved with the opening strains of "The Open Prairie" from Copland's ballet, "Billy the Kid," with random percussion sounds reflecting the essence of the remoteness of the Wild West. It took almost a minute to build up to a big push, increasing the tension. One of the trademarks of the corps has long been the presence of beautiful hand-painted flags, each one unique, which for this show were emblazoned with different Western motifs. Volleys of bass drums announced the gunfight between Billy and the posse sent to bring him to justice, with bright yellow flags emblazoned with sheriff's stars announcing the intent of the posse. 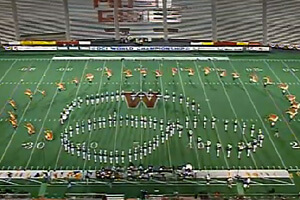 Performance excerpt of the 1992 Blue Knights. "Corral Nocturne" from Copland's ballet, "Rodeo," showed that the corps could take its time and let a piece breathe, delivering a work of soaring beauty that filled the field with melancholy reflection. (A little known fact is this movement was originally co-written with Leonard Bernstein, whose music filled the corps' entire show two years earlier.) "Happy Ending" from "The Red Pony" has long been a favorite of drum corps. After a brief minute-long segment of joyous abandon, "Corral Nocturne" returned to end the piece, with a few hints of "Appalachian Spring" thrown in the front ensemble and the final brass solo. The energetic finale from "Chorale and Shaker Dance" featured flags with dozens of hand-painted dots of various colors, a most festive look. And with the spirited and brisk conclusion of the show, Blue Knights proved that the corps' placement in the Finals the year before was no fluke. This week only, you can save on 1992 World Championship Audio and Video Performance Downloads on the DCI Fan Network. Buy the 1992 Blue Knights Video Performance Download. (Available this week only for $3.99. Regular price: $4.99.) Buy the Audio Performance Download bundle of all 12 Finalists from 1992. (Available this week only for $15.99. Regular price: $19.99.) Offer ends Monday, June 20 at 8:30 a.m. ET.